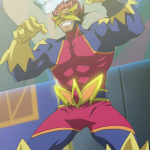 Nistro, known as Gauche in the Japanese and Italian versions, was Mr. Heartland‘s left-hand man and a committee member responsible for maintaining the World Duel Carnival along with Dextra. 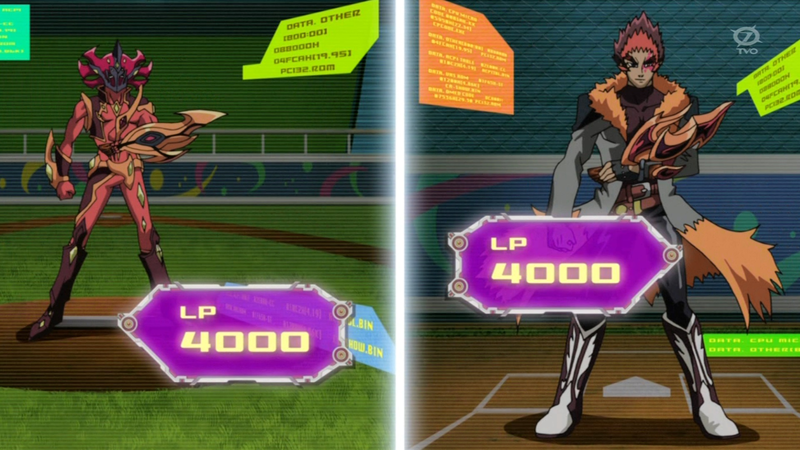 Ultimately, his and Dextra’s true task during this tournament was searching for “Number” cards. 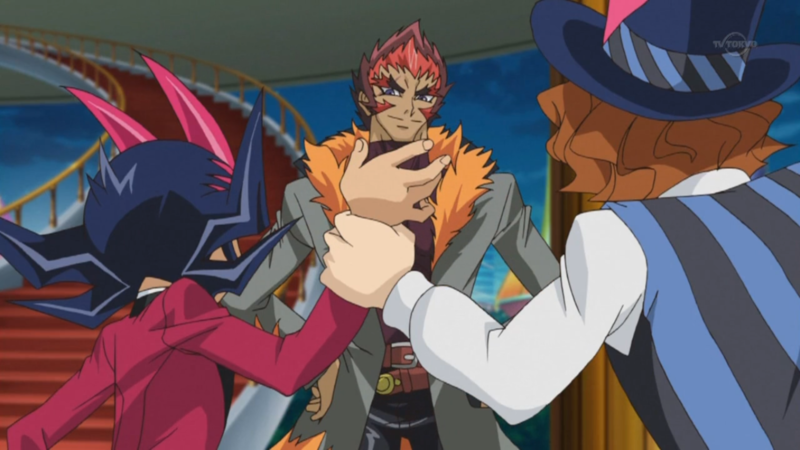 However, he resigned his position in order to join the World Duel Carnival along with his partner, with his goal being to defeat Yuma Tsukumo and the Original “Number” before Kite Tenjo did. 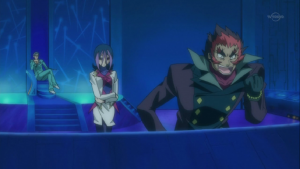 He later became a professional Duelist, with Dextra as his manager and is currently the Champion of Spartan City. Nistro has flame-shaped dark red hair with a lighter red fringe and purple eyes. He has a Duel Disk which looks a lot like Quattro’s, but more of a fireball based design. 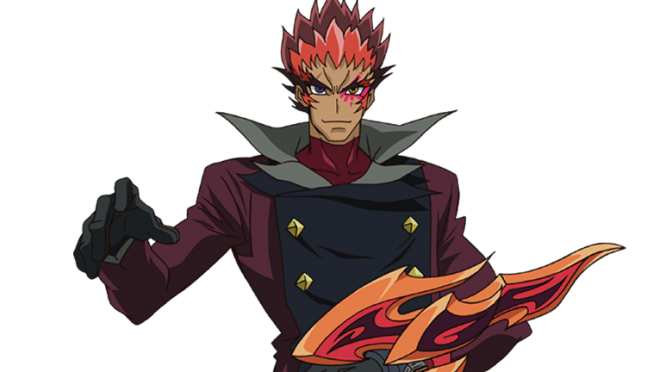 He also has a red Duel Gazer tattoo, like Kite Tenjo, Trey, Quattro, Quinton, and his partner Dextra. Nistro has used a black and dark red trench coat with a high collar over a red shirt with dark red trousers black shoes and black gloves as well as a bracelet on his left wrist identical to the one on Dextra’s right ankle. He can also be seen wearing a grey and black colored coat with orange ruffles as well as two belts and leather pants with white and brown cowboy boots. 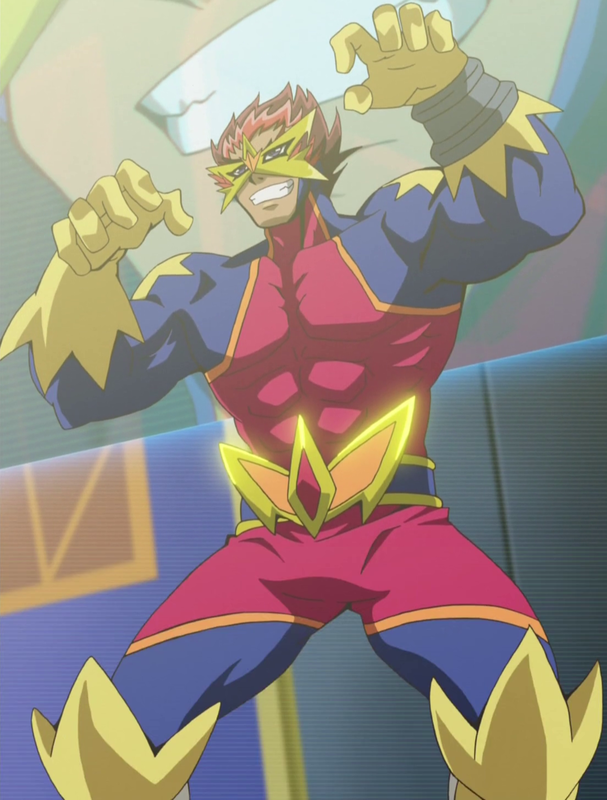 During the Pro Duelist Spartancity Tournament, Nistro wears a form-fitting blue and red costume, resembling that of a wrestler. He also dons a star-shaped mask whilst wearing this costume. His nightwear consists of a sleeveless, black vest, brown belt and black sweatpants with a grey line down each side. He also seems to take his job less seriously. This tends to cause frequent arguing with his partner, but they actually get along better than they initially appear and their Dueling styles complement each other well. It also seems Nistro values Dextra (or at least his colleagues in general) highly, as during their Duel with Yuma Tsukumo, he activated a card that served no other purpose than to take the hit for Dextra. 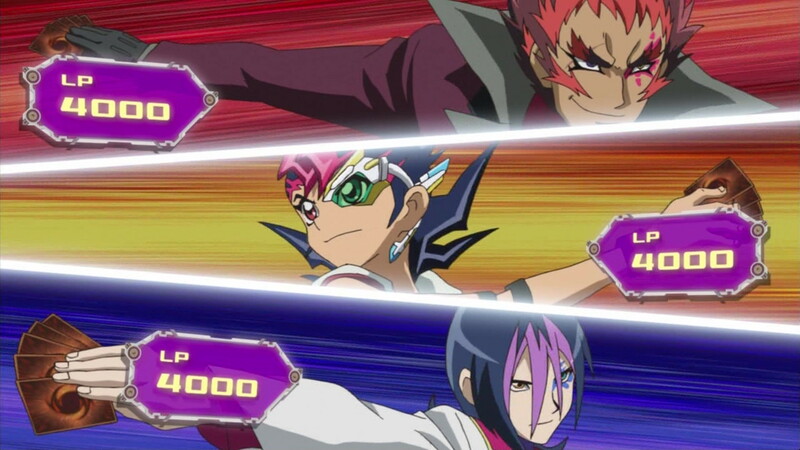 Nistro loves Dueling, heavily punishing anyone that dishonors Dueling. As a member of the committee, he is very severe when punishing a cheater, to the point of physically injuring the participant or forbidding him/her from Dueling in Heartland City for the rest of his/her life. Nistro can be quite competitive with Kite Tenjo, having some form of rivalry with him in collecting “Numbers”. Nistro is able to teleport. Whilst working for Mr. Heartland, Nistro uses a “Bounzer” Deck, which he replaced his original Deck with. It focuses on heavily punishing the opponent through brutish tactics. Using cards such as “Bounzer Guard” and “Photon Strike Bounzer”, he is able to disrupt his opponent’s tactics.